The Kiko goat was developed in the temperate climate of New Zealand in the late 1970’s. Feral does of this region possessed great hardiness as compared to many domestic breeds. The primary characteristic of the Kiko goat is its hardiness and its ability to achieve substantial weight gains when run under natural conditions without supplementary feeding. In New Zealand it has been called the “go anywhere, eat anything” goat signifying its ability to thrive under less than ideal conditions. Kiko does possess exceptional maternal instincts and should normally kid unassisted. Desirable, the Kiko doe raises twins to weaning that total in excess of sixty percent of her body weight under forage based conditions. Kiko kids are fast growing and reach early maturity. Although mature size is not as great as some other breeds, the kids grow faster and usually reach market weight earlier than larger breeds. Kikos are very aggressive foragers and do well under range conditions. Kikos also possess greater parasite resistance and have fewer hoof problems than many other breeds. Kikos prefer brush and browse over grass pastures and will eat many plants that are undesirable to other livestock species. Many farmers and ranchers have noted an increase in available grasses for other livestock after two to three years of running Kiko goats on their operations due to the Kiko goat eliminating invasive plant species. Kikos are an excellent choice for clearing brush and heavy undergrowth as they have a reach of approximately six feet high. Perhaps the defining characteristic of the breed is the rate of growth. The kids are born of average size but with considerable vigor. 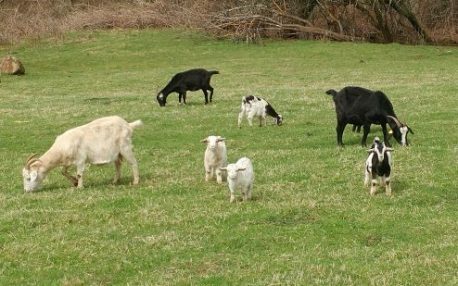 From birth to weaning the Kiko displays a rate of growth at least equivalent of any other purpose bred meat goat breed but this is achieved without the management and feed inputs generally required for satisfactory meat production in other breeds.